Kastro-Kyllini is a former municipality in Elis, West Greece, Greece. Since the 2011 local government reform it is part of the municipality Andravida-Kyllini, of which it is a municipal unit. Its seat of administration is in the small port town of Kyllini. Other settlements are Kato Panagia, Kastro and Neochori. The municipality's population is around 3,000 to 3,500 people. 2,392 of those live in Kyllini-Kato Panagia. The largest town is Kato Panagia; Kyllini, the municipality's seat, is second. 80% of the total population lives in urban areas. The remainder remains rural. The boundaries run west of Myrsini (munic. Lechaina) on a creek. It is the westernmost municipality in Elis and the Peloponnese. The boundaries with the municipality of Vartholomio run north and west of Machos and north of Dimitra. There are water towers in Kyllíni and Neochóri. 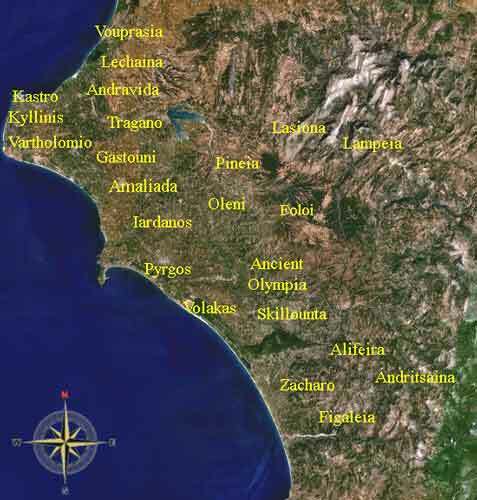 There are forests south of Neochori, north of Machos, and on the hilltops, especially near the west coast of Kyllini. Fertile land are found mostly on a plain, and on hill, including olive trees. Its coastline is about 16 km long, measured from west of Lygia to west of Myrsini Beach. There are nearly 1,500 buildings, units, hotels and hotel units, and houses in the municipality alone. Agriculture consists of tomatoes, watermelons, potatoes, and corn in the plains, while pasture lands, and olive production are very dominant because most of the municipality is hilly. Agriculture used to be dominant in their business before the 1960s. Most of the hotels after the late-20th century were built after the 1980s led by a sharp increase in tourism. There were only a few hotels in the region. An increase in tourism lead to expansion of hotels. Only about a quarter of hotels existed in the 1980s. After 2002, hotel expansion was halted. Currently, tourism is slightly slumping. Founded in front of the Ionian coastline, this town has plenty of hotels and villas like the Avocado. A spring south of Kyllini has the same name. The westernmost point of the Peloponnese is one of the most scenic destinations in Elia. Most of the hill is covered with forests and olive trees. The plain covers only about 20% of the land, and Neochori is the only village lying. Most of the area is forested; the remainder is agricultural. The peninsula's westernmost port, the Port of Kyllini is just east of the heart of Kyllini. Restaurants and stores are line up with a street overlooking at the sea. A military base is located to the southeast, off the Kyllini–Andravida Road, the former GR-84. The base contains luxury-sized houses for refugees. It is surrounded by barbed wire gates. There are no hospitals or health centers. The closest health center is in Varda. A monastery is located in Vlacherna southeast of Kato Panagia. Chlemoutsi, a fortress, was built to protect the invaders from other parts of Europe. Today it is abandoned, and has been turned into a tourist attraction. It sits atop a hill 135 m above sea level and surrounded by pine trees and houses from Kastro. Singers including George Dalaras (Giorgos Ntalaras) have entertained at the fortress. The Thermal Springs of Kyllini (the Kyllini Baths) are the largest beach facility in the western Peloponnese. In the mid-20th century, construction began on opening a spring linking with about 1 km of roads with parking lot 200 to 300 m from the sea with hot-sandy beach. Kyllini is in an earthquake zone. There have been several strong earthquakes in community's history. The most significant recent earthquake was the Ionian Earthquake in 1953, which caused moderate damage. Cape Kyllini is a cape located north of Kyllini. Between the cape and Kyllini is a small fortress named Glarentza and slightly east is the beach. It also offers a view of the island of Kefallinia from the north. The island of Kafkalida is the only uninhabited settlement. The island is rocky and has Kyllini's lighthouse. The lighthouse is about 20 to 30 m tall. It is accessed by a tiny port holding one or two boats and is not used for cars from the port of Kyllini. It is only accessed by a pathway. The northern half of the island are made up of rocks. The island about 100,000 years ago was connected with the mainland. Railways used to cover 9 km. They were abandoned with the opening of the Neochori bypass, and trains no longer run in the area. Along with the Neochori and Kyllini railroad stations and even one electric and three hand-operated crossings (totaling four) the rest didn't have any. They are abandoned. 15 trains used to run this track. Speed limit on these roads is 20 km/h for surfaced roads, 30 to 40 km/h on hilly slopes, including 4 km of Andravida-Kyllini road and narrow unused roads, and 60 km/h on by-pass and paved flat roads. About 5 to 10% are lined with bamboo sticks and about 10% are lined up with pines and other kinds of trees. Only its phone lines exist in front of the bush and grass-covered abandoned train tracks. 4 km of hydro lines opened around 2002, powers hydro to the island of Zante by the Greek (Hellenic) Hydro (ΔΕΗ, DEI or DE-E). The first paved road was Andravida to Kyllini road which was surfaced until the 1960s, then came Loutra Kyllini Road in the late-1960s, Kastro-Kyllini road came after, and road to Machos and road from Kastro to Kyllini came in the 1970s and to Kavasilas in the 1980s. Only less than a quarter of its roads were actually paved. In 1999, a new paved road opened for about 800 m which made traffic to Vlacherna made easier. Cars don't have to go around to follow the signs to the monastery. The distance was cut by 2 km. Distance from Neochori to Vlacherna is now 6 km from 8 km And from Lechaina 10 km from 12 km and before that, 14 km. The only road not paved which is about 4 km from Kastro is that narrow road connecting from Vlacherna to Kastro. Kyllini may pave that treacherous surfaced road to make better use of that route. About more than 40% to 50% of its road are actually paved. The other roads that do not link to villages especially country roads remain surfaced. The nearest national road is the GR-9 or E55, which is 10 km (originally 13 km) to the east. Kyllini (Greek: Κυλλήνη, classically Cyllene or Kyllênê) is the seat of administration of the municipality. The population of Kyllini hovered at 100 to 200 from its founding about 3,000 years ago until the mid-20th century, when it first surpassed 500. Kyllini has a school, a lyceum, a gymnasium a church, banks, a post office, gas stations, restaurants and a square (plateia). Kyllini is a town of about 2,200 people. It is a tourist destination and boasts the westernmost port on the Peloponnesian peninsula. The Port of Kyllini is the largest and busiest harbour of Elia in Greece. It is the peninsula's westernmost port. It carries cars, and automobiles to the harbours of Cephallonia at Poros, and Zante, at the city of Zante of the southern Ionian. It is a minor harbour, 50 km directly SW of Patras, 73 km (originally 76) SW by road, 45 km (originally 46) from Pyrgos, 66 km from Olympia. It is not as large as other harbours of Patras, and Greece. Operation is very small. The port is located not far from the centre of Kyllini. A playground, and a square neighbor the port. Buildings are found between and on the port. Beaches, restaurants, and hotels are located in the middle of the port. Before the closure of the railway, there was a railroad station that used to carry passengers by train. Now only the railroad hidden in bushes, and other types of grass remains without a train waiting to be seen. The harbour has access by road from Chlemoutsi, Lechaina, Andravida, Amaliada or Amalias, the area of Pyrgos, Southern Elia, Varda, Lappa, Western Movri, and northern Messenia. Fish is common in the ocean as the boats float away from the harbor. Tens of boats are in the harbor. Around 5 to 6 ferry boats are founded. Each carrying 3,000, sometimes 5,000 automobiles every day to the islands by boats owned by Ionian and Strintzis, 800 are carried to Kefallinia in and out of port of Poros, and thousands are carried to the port of the island of Zante each day. The harbor was very small and carried only passengers. The harbour had been bombed by the German's during the Second World War, destroying the quay. Improvements were made later and started the ferry service to the Ionian Islands. The harbor was extended by around 75 to 100 m. Lights from poles were begging to be lit. Later in the late 1990s, increasing amount of traffic led to a redevelopment and expansion of the port. The port's land increased to about 150 to 180 m further to the sea. The size of the port is now about 5,000 to 10,000 m². In 2001, train service was cut off or abandoned due to the opening of the road connecting direct traffic from Kyllini to Myrsini bypassing Neochori, like a beltway. Kato Panagia (Greek: Κάτω Παναγιά) is a town located about 1 km from the centre of Kyllini in the western part of the prefecture of Ilia. It is accessed by a road connecting Kyllini and the port and GR-9/E55. The population is slightly larger than Kyllini and is the largest town in the municipality. It is located about 13 km W of GR-9/E55, about 75 km SW of Patras, about 49 km NW of Pyrgos, about 11 km (old: 13 km) W of Lechaina, about 12 km (old: 14 m) W of Andravida, about 13 km NW of Vartholomio and 6 km N of Kastro. The Ionian Sea is further north. Ikaros (Ίκαρος) - A subdivision located about 3 km east of the centre of the community is founded in the east. The nearest settlement is Vytineika. Much of the hilly part are made up of mainly pine trees and some groves in the south with some in the north and within the road. Farmlands are within the soureline. There are about three to four hotels and resorts including Avocado. The old railway ling (Kyllini - Kavasila) ran in the middle of the shoreline and the highway. Gas stations (formerly Avin) are situated in the east near the boundary. Pine trees are situated in the south. The central part are made up of a military camp which has gridded streets and large houses made for refugees. It has two gates in the north which receives no entry to unauthorized vehicles of personnel. It is numbered 118. The water tower is in the east. The population was one of the slowest growing settlements in the prefecture. Kato Panagia has a two schools, a lyceum, a gymnasium, a church, a post office, a gas station located in the east, and a square (plateia) which is located in the centre next to the communal hall. A few resorts are situated in the east. The streets downtown are gridded. Much of the land are hilly and a small portion of the land within the shoreline are about a range to 5 m above sea level. The panorama of the small islands including Oxeia during the clearest days can be seen. Not all areas can see Kefallinia. Mavros Oros and parts of Aetolia can also be seen. Farming which includes pastures, vegetables and groves are in the north and east with a few pine trees. The hills are in the south, southeast and west and are mainly covered with pine trees with a few groves. Most of the groves are in the west. Kato Panagia had no train station and the tracks are about 50 m from the road. The nearest station (Kyllini - Kavasila) was next to the port which is now abandoned or no longer in use. The communal boundary with Kyllini are situated 100 m to the west. Kastro (Greek: Modern: Κάστρο, Ancient/Katharevousa: -on) is a town located fifteen km west of the GR-9 between Lechaina and Andravida. The distance from Patras is 76 km SW. Its neighboring communes are Kyllini and Kato Panagia to the north, Neochori and Machos to the east, and Lygia to the south. Its nearest beach is Melissa Beach to the west. The famous Kyllini Baths are two and a half km NE. The town of about 800 people lies close to the peak of a slightly forested hill. The town has a school, a church, a square (plateia) and a post office. Much of the community is covered with groves and forested with a hilly setting. Most of the arable land is mixed and lies to the east of the town. The Thermal Springs of Kyllini (Greek: Λούτρα Κυλλήνης, Loutra Kyllinis), also as Kyllini Springs or Kyllini Baths is a thermal spring area with hotels, restaurants, and a beach located on a southwestern tip of this peninsula. The setting is all forest covering the western half of the small mountain range. The length of the road is 1 km west of the junction of a road to Kastro, Neochori and Patras and to Gastouni and Pyrgos. Distances from other places are 2 km SW from Kastro, 75 km SW of Patras, 10 km W of Vartholomio, 16 km W of Gastouni and about 43 km NW of Pyrgos. The western and the eastern parts is the Ionian Sea. A view of Kastro and Chlemoutsi fortress can be seen mostly over the hilly forests which also cover the east. Tourism was famously very popular in the 1980s and the 1990s. North of the springs has another campsite and Melissa Beach which bears its name. The most famous baths also offers inhalation therapy, said to assist in asthma and skin problems. It is situated next to the Roman ruins. For more details on this topic, see Chlemoutsi. View of the Chlemoutsi Castle. On the hill lies the Chlemoutsi fortress or the castle which the town receives its name (elevation: about 200 m). It was built by prince Geoffrey I Villehardouin of the Principality of Achaea in 1220-1223, who called it Clairmont (from which Chlemoutsi is a derivation ). After the decline of the Principality the castle gradually lost its importance. Today it is as a monument and is sometimes used for concerts. Neochori (Greek: Modern: Νεοχώρι, before the abandonment of Katharevousa: Νεοχώριον Neohorion or Neochorion, 1970s-1990s: Neohori) is a village 6 km SE of Kyllini, 6 km NE of Kastro, NW of Dimitra, and 7 km west of Lechaina, almost originally between the two communities. Its nearest communities and village are Vytineika (village) and Kyllini to the north, the Ionian Sea to the north, Myrsini to the east, Dimitra to the southeast, and Machos (village) to the southwest. The village has a train station which is no longer used, a school, a church in the centre, a square (plateia), and 3 gas stations in the east. After 2001 or 2002, traffic between Kyllini and Lechaina is no longer used. It's now bypassed about 1 km north of the centre and away from Neochóri. South of the village, forests cover the southern half along with olive groves, north of Neochori, and are sporadically founded in the plain and some hills northwest. It's bounded by a military camp northwest along with its closest beaches. Agriculture used to dominate the market of Neochori until the late-20th century. The beaches in the north aren't usable because the surface is rocky between Avocado and slightly west of Myrsini Beach. The view of the castle of Chlemoutsi can be seen at its closest, one of the closest. The village is 1 km east of the hills and sits in the westernmost part of the plain.